Basil Johnson (21 November 1919 – 25 August 2011) who died in Canberra, aged 91, had capitalized upon the peripatetic nature of his life’s trajectory to become a quintessential geographer. Born at Cockpen, Midlothian, Scotland, as the fourth child of Dorothy and the Reverend William Johnson, he made several moves of abode within Great Britain before his father became Vicar of All Saints, Dunedin, New Zealand in 1928; he returned to England in 1935 when his father took up a living in Northallerton, Yorkshire, where he attended the local grammar school. By then his footloose existence had given him a deep interest in geography. In 1938 he went up to King’s College London to read Geography under Professor S.W. Wooldridge. This period was cut short when he volunteered for war service. As a budding geographer, he could not refuse the offer to serve in British India. After initiation in Aldershot, he was dispatched in 1940 as a Royal Scot replete with tam-o-shanter and pith helmet en route to becoming a gentleman officer in the Royal Indian Army Service Corps (RISAC) once he reached Bangalore. Assigned to the Supply and Animal Division much of his early training was spent on bicycle drill — the art of riding two-abreast cavalry style. His sojourn in India equipped him for the rest of his working life by providing an opportunity to get to know the country, acquire knowledge of both Urdu and Hindustani, and make lifelong friends. He acquired the habit of meticulously recording his observations, including sketches and block diagrams. He chronicled his travels by various modes of transport throughout British India in a ‘fieldbook’ dated 1941-44 replete with an index to over 250 photographs. His only brush with military action was a spell in Chittagong when the Indian Army was resisting the Japanese army’s advance through Burma. While he was sure that the Allies could have done without him, true to the Indian proverb, he had seen ‘a hundred men on the road to Delhi, and they were all my brothers’. In 1944 he volunteered to move to Egypt to be in charge of a transport unit first in Cairo and then in Alexandria, where he also taught geography in an English Girls School. The following year he returned home guiding the inexperienced pilot of the South African Airforce Dakota to Croydon Airport by drawing upon his knowledge of the geomorphology of the Southeast England inculcated by Wooldridge and the fact that his aunt lived there. He completed his Bachelors Degree at King’s College London in 1946 and took up a lecturing position in the Geography Department at the University of Birmingham during its formative years under the late Professors R.H. Kinvig and D. L. Linton. By 1950 he had completed a Masters thesis at the University of Birmingham on ‘The Charcoal Iron Trade of the British Midlands: 1690-1770’, which is still cited some 60 years later because of its critical insights into the Black Country’s pivotal role in the Industrial Revolution. Nevertheless he was unable to get South Asia out of his system. In 1956 he was offered an UNESCO Regional Cultural Study Grant enabling him to return to what had become East Pakistan after Partition (later Bangladesh). Subsequently, he became a consultant to Food and Agricultural Organization (FAO), Rome, on both East Pakistan and the Mekong River Project. By 1960 the opportunity to revisit South Asia had been transformed into a PhD treatise on the ‘Agricultural Geography of East Pakistan’, which was presented at London University. 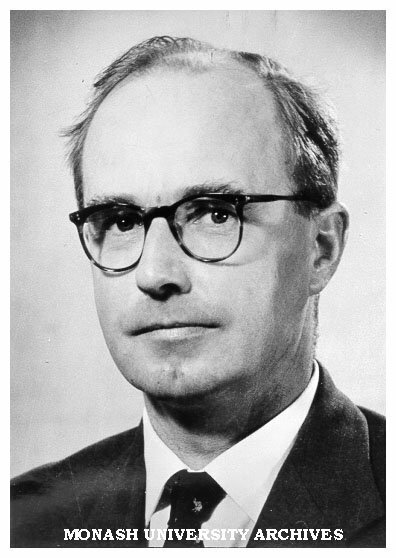 In 1962 he became the Foundation Professor and Chair of Geography at Monash University in Melbourne. Although this was a time of ferment in Geography with the proliferation of sub-disciplines, he stuck by his credo, instilled by Wooldridge, that regional geography was the highest attainment of the geographer’s art and focused on producing a series of textbooks on South Asia. This activity was reinforced by his major role in assisting the development of geography teaching in schools in the State of Victoria as both an examiner and driving force for curriculum development. He was Vice-President of the Geographical Teachers Association of Victoria (GTAV) during his time at Monash and a senior member of the Geography Standing Committee of Victorian Universities and School Examination Board (VUSEB). Once he had firmly established the Geography Department’s foundations, now almost fifty years old, he was ready to further his South Asian interests and heighten our consciousness of the changing geography of India, Pakistan, Bangladesh and Sri Lanka. In 1971 he was appointed Professor of Geography in the School of General Studies at The Australian National University (ANU), with the opportunity of continuing the focus on South Asia pioneered by the late Professors Oskar Spate and Andrew Learmonth. Again, besides presiding over a rich and varied teaching department, he produced a series of books on Bangladesh, India and Pakistan that were later translated into Japanese. He also became an expert consultant for the Australian Development Assistance Bureau (ADAB), which included being part of feasibility teams on cattle and sugar projects in Bangladesh and reconnoitering South Asia to assess aid needs. In 1980 he took early retirement and became a Visiting Fellow in ANU’s Centre for Development Studies and continued his publications on South Asia, including a text on Sri Lanka and an overview of the entire region. By the mid-1980s he expanded his consultancy work as an aid advisor to the Australian High Commission in Sri Lanka and undertook further studies for ADAB as a member of the Pakistan sheep/wool appraisal team and provided technical advice on other South Asian issues. Later he used the depth of his intimate geographical knowledge of both land and people in South Asia to write two novels: Asoka: His Own Man and Jaffna, Bloody Jaffna: A Novel of Ethnic Loves, Loyalties and Civil War. He also compiled the first-ever Geographical Dictionary of India. A lasting legacy is the Basil Johnson Photograph Collection in the Davidson Library, University of California, Santa Barbara, which comprises carefully referenced slides on Borneo, Cambodia, Malaya, Pakistan, Singapore and Thailand — a treasure trove for future researchers. By the early 2000s he interspersed his academic pursuits with bird watching, photography, watercolour painting, producing audio books for the blind, helping slow readers at a local primary school, regularly visiting sick and immobile friends, writing and illustrating anthropomorphic tales for his grandchildren featuring Australian and Asian plants and animals, composing a batch of poems, sometimes irreverent, including a masterpiece in praise of wombats. He lectured for the University of the Third Age (U3A) on contemporary matters, exploring such flash points as Afghanistan and Kashmir, and was an active member of a series of local organizations and a life member of the Royal Geographical Society. His wife Delia, whom he first met at Northallerton Grammar School and married during leave from the army in 1945, provide stalwart support throughout his career. Delia died in 2002, and his companion, Annelot, his five children, Michael, Margaret, Meriel, Christopher and Nina and their partners, twelve grandchildren and ten great-grandchildren survive him.